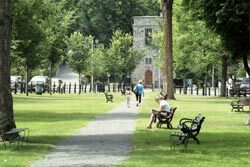 The world-renowned historic village of Woodstock, Vermont was described by Ladies Home Journal magazine as "The Prettiest Small Town in America". It is no surprise then to find yourself mesmerized by the panorama as you wind past perfectly restored historic buildings and homes to open on the sprawling Woodstock Village Green; Or, that you are awed at the spectacle of quaint New England shops, galleries, lodgings, and eateries spreading out before you and whisking you back in time; Or, that the sun dancing through the trees, shimmers down side streets and into alcoves to romance you with the eloquent ambience emanating from this legendary historic New England village. And, if you were unsure before your arrival in this quintessential New England town, you now fervently agree that the Village of Woodstock, Vermont is indeed "The Prettiest Small Town in America". For over 200 years, the focal point of Woodstock Village has been the famed site of what is now known as the Woodstock Inn. The original structure was built in 1792, and in 1874 tourists were inspired to flock to the area via "The Woodstock Car" - a rail car that departed nightly from Grand Central Station in New York City. In 1969, after being approached to renovate the then existing structure, Laurance S. Rockefeller (grandson of John D. Rockefeller) deemed the old inn unsalvageable and replaced it with the current, stately structure. The Rockefellers have been friends of Woodstock for generations, and in 1998, Lady Bird Johnson and Laurance S. Rockefeller attended the dedication ceremony of the Marsh-Billings-Rockefeller National Historical Park - a 550-acre forest surrounding the M-B-R Mansion, with interpretive tours denoting the history of conservation and the evolving nature of land stewardship. Similarly, the nearby Vermont Institute of Natural Science offers a Raptor Center, with its goal being to protect Vermont's natural heritage through education, research, and the active care of our environment. Another Woodstock treasure is the Billings Farm & Museum, where you can discover rural Vermont farm life at a working farm and museum. The Woodstock Historical Society recently introduced a new multimedia exhibition featuring "Woodstock Works" at its historic 1807 Dana House Museum. And, the Pentangle Council on the Arts presents music, drama, dance, and movies at the Historic Town Hall Theater, with free noon concerts and a school 'Arts in Education' program dedicated to keeping the arts alive in the community. An exciting addition to the list of area attractions is the Ottauquechee Valley Winery, now offering a daily Wine Tasting Program with Winery Tours scheduled to start next season. Woodstock is home to a variety of beautiful country inns, hotels, motels, and casual to elegant dining venues. We highly recommend the following: The Prince & Pauper, where fine food and spirits abound at an award-winning, chef-owned gem of a restaurant; The Jackson House Inn (photo), where the the luxurious accommodations complement the 1890 Victorian mansion and the Chef creates the finest new American cuisine; The Lincoln Inn - a country inn and restaurant located just west of Woodstock Village on Route 4. The Pondridge Motel, conveniently located offering comfortable and affordable accommodations. And, The Shire Motel, overlooking the lovely Ottauquechee River and offering guest rooms with full baths. The Canterbury House B&B, an 1880 Victorian Townhouse located in the Village of Woodstock - a comfortable and convenient bed and breakfast inn walking distance to shops, restaurants, and galleries. Indulge yourself with a stroll around the Woodstock Village Green, walk downtown to visit a shopping mecca of quaint boutiques, antique shops, unique galleries, gift and souvenir stores, New England crafts and wood creations, clothing retailers, sweet shops, glass, brass, and candleworks. Arouse your senses as you stroll past dining venues and eateries as varied as the aromas on the breeze. As evening turns to dusk, old-world wrought iron lamp posts set along cobblestone walks emit a warm glow as though yearning to reveal a great artist's rendering of this Quintessential New England Village - a place set apart for your timeless fulfillment of heart, mind, body, and soul. Whatever your whimsy might be, let it be quelled amid the esthetic wonders and bristling fragrances found along your nostalgic journey through Woodstock, Vermont. Come for a day, a week, a month or a year, renewing your spirit in a land seemingly suspended in time.